Google has launched a new feature in its updated Gmail for Android app that lets users view emails from all their integrated email IDs in a single place. The feature is not limited only to Gmail IDs, and includes Yahoo and Outlook-based IMAP and POP accounts as well. As you probably recall, support for multiple email IDs was launchedin November last year.The new feature is accessible through a tab called ‘All Inboxes’, which is available after updating the Gmail for Android app to the latest version. This allows users to read mails from all of their accounts without having to move in and out of individual accounts. Google believes that this is ideal for users who maintain multiple accounts for different purposes, such as work and personal accounts. The app extends the most popular features of Gmail to other integrated IMAP/ POP email accounts as well, such as conversation view and search. The app will now stack conversation threads from other accounts in the same efficient way of Gmail, and also allow users to search through other accounts using the search bar. Google says that auto-complete accuracy while searching has also been improved. Additional improvements to the Gmail for Android app include more responsive animations, larger attachment previews and the ability to save to Google Drive with a single touch. 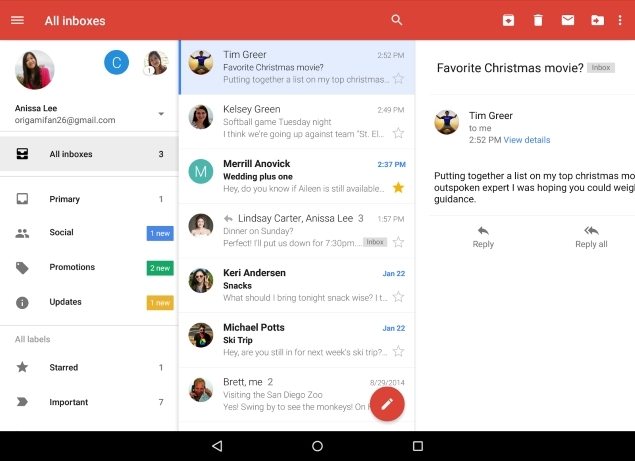 The Gmail for Android update will roll out to users over Google Play in the coming days, says Google on its official Gmail blog.